ADIBAH AMIN, the observer and chronicler of all things Malaysian and more, who lives in Johor Bahru, was in Kuala Lumpur recently for the launch of her first novel in English, This End of the Rainbow (Phoenix Press, 2006). 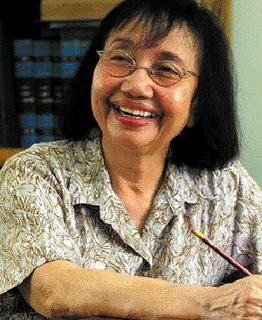 Amidst an intimate gathering of journalists and publishers, the veteran columnist talked about her life and the writing life with amiable forthrightness. This End of the Rainbow is based on her memories of her student days at the University Malaya in Singapore. Set in the 1950s, it’s a tale of a group of university students and their dreams for the future. However, they are soon torn between their own sheltered lives and the harsh realities of colonialism and the challenges of ethnic diversity, racial prejudices and social injustices as well as the strains between Malaysia and Singapore. A character-driven novel, Adibah uses lots of flashbacks into the childhood of the characters to propel the story forward. “I have been writing bits and pieces of the novel since 1952 and keeping them in a big box. The events and people in this novel have lived in my mind for years and it’s only now that I’ve finally found the courage to let them see the light of day. I am sharing with you, dear reader, the experiences of a group of young people, students of the University of Malaya in Singapore, in the early 1950s. “Amidst the frolic, the exam fever, the friendships and romances, the camaraderie and conflicts of college life, they were awakening to issues such as colonialism, social injustice and racial prejudice. Unable to isolate themselves in the ‘ivory tower’ as some of their college-mates did, they were acutely aware of the independence movement in Malaya (now Peninsular Malaysia) and Singapore, and of the sort of society that might emerge afterwards. “They look into their own hearts and saw unhealed wounds: memories of loved ones lost or worked to death during World War II, or killed in the racial clash of 1945, or victimised for being freedom fighters in the 1950s. They realised the depth of their bitterness and that of others who had suffered in similar ways. If the wounds were left to fester, all hopes of national and world unity would die. “As you will sense, this is my deepest concern. I pray that all of us in our ways will work towards the ‘pot of gold’ on the other end of the rainbow: our shared dream of lasting harmony,” Adibah writes in the preface to her novel. To cause to move forward or onward. Thanks for pointing out my error. Again. this book is high on my list of priorities. but haven't found it in the bookshops yet. I was told that Adibah's first English novel should out be in the bookstores next week. I am also looking forward to owning a copy of Tan Twan Eng's The Gift of Rain, a book to make Malaysia proud. I really don't mind being edited. As an editor, I have learnt a great deal from writers as well. Despite my constant diatribe against bad writing, there are some great writers here among us. I really appreciate these highlights of new Malaysian titles. I wish there were more such updates. I believe you can purchase this title from MPH Online. http://www.mph.com.my/search/nsearch.cfm?do=detail&pcode=9834262760. Similarly for the Tan's Gift of Rain http://www.mph.com.my/search/nsearch.cfm?do=detail&pcode=1905802056.